Enhance your Fire Prevention Week™ event and engage guests with the Open House Starter Package. Fire Prevention Week (FPW™) is a critical time to remind your community that fire prevention and safety are a year-round responsibility for both adults and children. 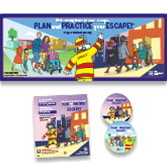 The Open House Starter Package from NFPA® includes essential products for marketing your event, engaging audiences of all ages, and educating the community on how to reduce the likelihood of fires and respond in case of an emergency. This giveaway bundle is full of materials featuring the smart and resourceful character Simon, who's helping Sparky® spread the 2018 Fire Prevention Week theme, "Look. Listen. Learn. Be aware. Fire can happen anywhere.™"
Whether you're hosting an event at a school, firehouse, senior center, or anywhere in your community, the Open House Starter Package will help make a powerful impression on your guests. Order today, and don't forget to shop our complete selection of 2018 Fire Prevention Week products to maximize the impact of your next open house.